The Warriors have far too much firepower for the Los Angeles Clippers to overcome in their first-round NBA playoff series. It was evident Saturday night at Oracle Arena when the two-time defending champions didn't have nearly their A-game but still ended up cruising to 121-104 win behind Steph Curry's 38-point barrage. To anyone who watched Game 1, it's clear the series appears to be headed for a sweep as the Clippers just don't possess the talent needed to overthrow the NBA's king. 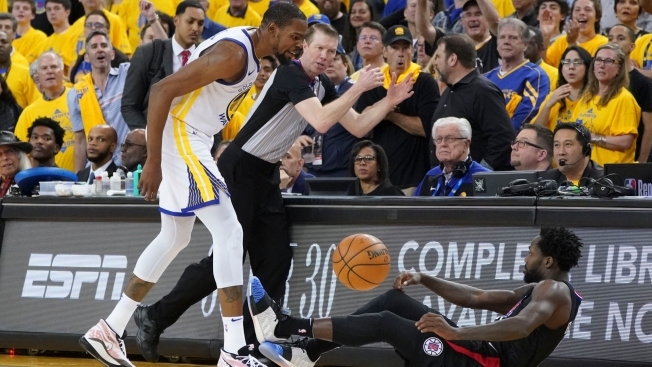 Game 1 was a hotly contested, physical game that saw a number of the Clippers receive technical fouls, and saw Kevin Durant and Patrick Beverley get ejected in the fourth quarter. Getting under the Warriors' skin, the way Beverley did to Durant, is the only way the Clippers will have a chance in the series, according to Warriors head coach Mike Brown. "We don't want to take the bait," Brown said on "SNC: Warriors Playoff Central." "There's no way I'd ever want to trade Kevin Durant for Patrick Beverley. We love the guys that we have on this team, and so one of our keys heading into this series was: we know we have to be poised against this team. They have no other way to beat us unless they junk it up, and they take advantage of us either getting kicked out or doing something silly to make it an advantage for them." After the game, Durant vowed to keep his poise during the remainder of the series, while also showing respect to Beverley and the grit that he brings for the Clippers. The Clippers' collection of role players can pester and annoy the Warriors for the next three or four games, but the only way it goes longer than that is if the Dubs play into the Clips' hand and engage in extracurriculars that takes their mind off the task at hand -- swatting away the annoying fly and advancing to the Western Conference semifinals.